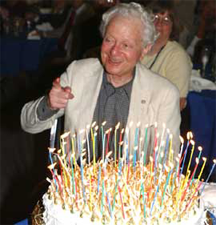 1988 Nobel Laureate Leon Lederman celebrating his eightieth birthday. Trick birthday candles work the way they do because their wicks contain an ingredient that can be ignited by the glowing ember that remains when the candle is blown out. One common ingredient that serves this purpose is magnesium dust. Because magnesium burns in air, the dust particles burst into flame, and that flame is hot enough to reignite the plume of unburned paraffin that streams from the just-extinguished wick. In political frame-ups, the role of the magnesium is played by the bystanders who unsure about both the framer's claims and the framer's targets. They're sometimes swayed by the sheer numbers of colleagues who give credence to the accusations of the framer and the framer's proxies. It is thus advantageous to framers to persuade large numbers of people of the accusations as rapidly as possible. Photo courtesy Fermi National Accelerator Laboratory. Have you ever felt as if you were being framed? Have you been accused falsely of organizational negligence or evil-doing by someone who knows well that the accusation is false? Last time we explored how framers use communications to construct frames. Here are some other strategies framers use. Using communication through multiple channels, framers ask about and report various incidents, slanting their reports to serve their aims. They might use face-to-face communication, telephone, and the entire array of electronic formats, but they prefer private and unrecorded channels, because of the risk of having their misrepresentations revealed. They portray their targets as intentional, hypocritical, or malicious; their allies as enthusiastic, honest, and public; and themselves as innocent, pure, and sympathetic. As the target, you can't control how the framer uses spin, but you can control what you say and do. When you have to speak about topics that are already in play, speak before multiple witnesses, on the record. Anticipate what might be spun, and explicitly close those opportunities. For instance, if you're accused of assassinating President Lincoln, you can say, "Yes, in the third grade, I did learn that Lincoln was assassinated 120 years before I was born. A sad day." Sometimes framers enlist proxies to construct frames. Some proxies have the same goals as the framer, but often they're simply misled by the framers' fabrications. Targets understandably tend to feel attacked and hurt when people repeat false accusations. Because some attackers are misled, targets fare better when they distinguish between the misled and the malevolent. Asking clarifying questions is one approach. For instance, in private: "Are you aware that I wasn't even born when Lincoln was assassinated?" When you can expose misleading statements of the framer, you disable the proxies, and perhaps rescue your relationships. Proxies who exhibit little interest in facts are probably internally motivated, rather than misled. cakeful of trick birthday candlesknow that spin and fabrication are not durable. To maintain the frame, they work several fronts simultaneously, possibly with different parts of the audience. If audience segments interact weakly, as one might find in a dispersed or global organization, the framer can deploy the same fabrication at different times in different audience segments. To targets, this can feel like a game of whac-a-mole, or like blowing out a cakeful of trick birthday candles. Counter the multiple-front assault with communication. Do what you can to open communications, becoming visible to all audience segments. Form personal relationships with important members of the audience. Create a sense that "My goodness, Linda couldn't possibly have said that." For a discussion of the connection between false accusations and confirmation bias, see "Confirmation Bias: Workplace Consequences Part I," Point Lookout for November 23, 2011. Would you like to see your comments posted here? rbrenXRbXEswLqxSDXfrRner@ChacciJKFTVhhUjYNhBnoCanyon.comSend me your comments by email, or by Web form. I offer email and telephone coaching at both corporate and individual rates. Contact Rick for details at rbrentUAvkhbbcWedTSPoner@ChaculChGnNtsTDlDyzYoCanyon.com or (650) 787-6475, or toll-free in the continental US at (866) 378-5470.